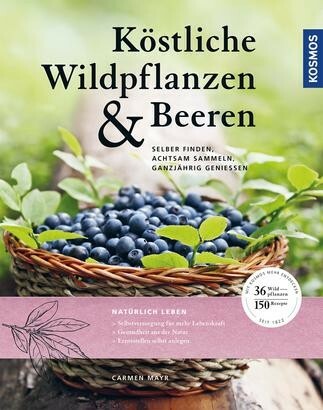 Product information "Köstliche Wildpflanzen und Beeren"
Interest in the topic "edible plants" is reaching increasing numbers of people. Healthy food from nature not only provides us with important minerals, but also with vitality. Harvesting wild garlic, goutweed or blueberries is already pure slow-down and lets us participate in the power of nature. Conscious and attentive collecting causes you to connect with the plants and to process them carefully and lovingly – for fresh enjoyment in Spring, Summer and Autumn, and for delicious meals in Winter. When we take care of the wild collection spots we not only help our own health, but also nature.